As fall approaches, I’m excited about many things: the prospect of playoff baseball returning to Baltimore, Ravens football, cooler temps, Oktoberfest beer, Halloween – and horror films. I’ve long had an affinity for horror films ever since I was a child and my parents forbid me from watching the movies that used to air every Saturday afternoon on WNUV. Even censored, these films had a lasting effect on me as a young movie fan. Sure, there’s T&A and gore that are (unfairly) synonymous with many horror films, but for me it’s more about the atmosphere and the suspense, which is probably why Halloween and The Exorcist remain two of my favorite horror films. These films are very much horror films, yes, but more importantly, they are films that happen to be horror. And that’s what’s been lost in the horror genre — the feeling that you’re watching a film, first — one that just happens to be a horror film. Think Silence of the Lambs. I don’t necessarily think of that film to be a horror film – but in many ways it’s one of the best horror films ever, and the last (and maybe final) horror film to win Best Picture. Maybe it’s the slasher films that saw their rise in the early 80’s, or the clichés that most horror films can’t free themselves from, but horror films get a bad rap these days, and usually for good reason. Ever scanned through the list of Redbox films available for rent? There’s dozens and dozens of low-budget horror films polluting the menu, making it harder to find the respectable film you want to rent. But there are still good horror films out there and 2016 is shaping up to be a high water mark for the genre. It’s not even fall yet and already we’ve had almost a dozen horror films that have stood on their own, not just as horror films, but excellent films, period. 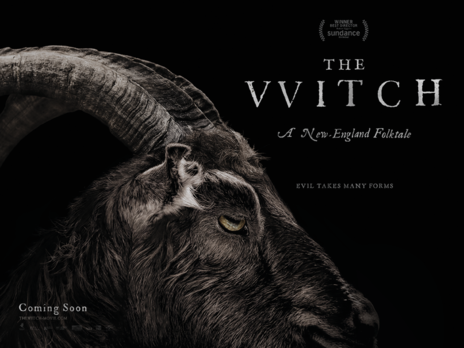 Although it was screened at the Sundance Film Festival way back in January 2015, The Witch kicked off the year with its wide release in 2016 and has been one of the best-reviewed films of the year, according to Rotten Tomatoes, where its “certified fresh” at 91%. The film takes place in colonial New England, uses authentic dialog of the times, which resulted in this viewer needing to rely on subtitles, and tells the tale of an isolated family’s possible possession by a witch. In a time where infantile America was all fire and brimstone, this family has been forced into exile for being too religious. And this ultra-religious fanaticism results in a thrilling dynamic when family members start to disappear. Is it God’s will? Or is there something more sinister to blame? 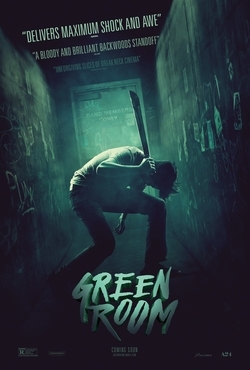 Then there’s Green Room (91%). I may need a second to compose myself after having flashbacks from this film….OK, I’m better now. Jeremy Saulnier burst onto the scene with the neo-noir Blue Ruin, my favorite film from 2014, and has one-upped himself with Green Room, a claustrophobic survival film about a punk rock band playing a concert in neo-Nazi backwoods Oregon that witness a murder inside the club. Needless to say, the perpetrators want to make sure this band doesn’t come out for their encore. Saulnier’s matter-of-fact approach to violence is unsettling. I’ve not been filled with dread while watching a film in a long time – maybe never at this level. Combine that with one of the last performances from Anton Yelchin, who plays a character reluctant to become violent in order to survive a violent situation. Yelchin is the beating heart of the film, even in his tragic real-life death. Contrasting Yelchin’s character is Patrick Stewart’s menacing club owner who meticulously plans the band’s demise in order to cover up the murder. I can’t recommend this film enough, but you’ve also been warned. I’ve not yet seen 10 Cloverfield Lane but it also has a rating of 90% on Rotten Tomatoes. How it dovetails in with 2008’s Cloverfield is a mystery I’m excited to find out. Meanwhile, The Conjuring 2 scored an 80% rating – surprising for a horror sequel. The shark-terrorizes-surfer film, The Shallows notched 77%. Even the threequel, The Purge: Election Year nabbed a respectable 54%. Netflix’s original film, Hush, about a deaf writer being stalked by a masked intruder in the middle of nowhere, sits at 100% with 13 reviews. The director, Mike Flanagan, is a Towson State University alum and has risen through the horror ranks quickly, having directed the well-reviewed Oculus, and has been rumored to be directing a new entry in the Halloween series which is good news to fans of that series. But the three horror films I’m most excited about in 2016 are surprisingly big studio releases. Fans of the genre have recently had to rely on indie or foreign films to give us good horror – but many of the films I just mentioned were wide-release major studio films. 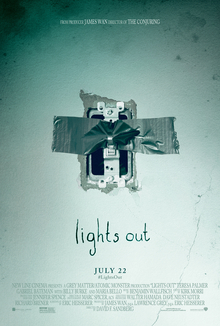 Up first is Lights Out (76%) about a demon that can only be seen in the dark. This leads to many potential scares just by flicking the light switch on and off. The Rotten Tomatoes summary says, “Lights Out makes skillful use of sturdy genre tropes — and some terrific performances — for an unsettling, fright-filled experience that delivers superior chills without skimping on story.” Sign me up. 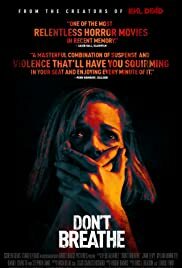 Next up is Don’t Breathe (86%) currently the number 1 movie in America, having just made $26 million dollars during its opening weekend. That may not sound like much in the era where $150 million opening weekends occur regularly, but for an R-rated horror film opening up during the dog days of summer, it’s a thrilling success story for the horror genre. Directed by Fede Alvarez, who helmed the Evil Dead remake and achieved the impossible – remaking one of the most popular cult horror films of all time – and in many ways improving upon the original. Alvarez has scored another winner with Don’t Breathe, about three burglars who quickly realize the blind war vet they planned to rob is more deadly than they could have ever imagined. Like Flanagan, Alvarez has quickly become a horror director to watch. Rounding out these anticipated horror films is Blair Witch. Yup, we’re talking about a sequel to The Blair Witch Project. It’s hard to believe it’s been 17 years since the release of the original, but after a turkey of a sequel in 2000, the Blair Witch franchise sat dormant until Adam Wingard and Simon Barrett (the team behind You’re Next and The Guest) made this film in secret, dropping the premiere on a crowd of unsuspecting Comic-Con attendees in late July. Thinking they were seeing a horror film called, The Woods, which would have been great since Wingard and Barrett have established themselves as the masters of 80’s nostalgia horror, the crowd actually viewed the new sequel to the original film. Early reviews at Rotten Tomatoes are flawless – 100% with 8 reviews in. Horror fansite, Bloody Disgusting compared it to The Exorcist (yeah they went there! ), saying “Blair Witch is a horror game changer that will completely wreck you…it may just be the first film since The Exorcist that will leave younger audiences scarred for life.” Now I don’t expect to have people vomiting and passing out during showings of the movie, but that bold comparison to one of the best movies ever, period, can’t help but get me excited to see it when it comes out September 16. If the success of Wingard and Barrett’s previous films are any indicator of how good Blair Witch will be, the early praise it’s been receiving will be well received. Are there any other horror movies that you’ve seen this year that deserve to be celebrated for helping revive the genre? Let me know, come discuss it in the BSL Forum. Written by Sean Jester. Posted 3 years ago in TV & Movies. Sean is a Baltimore native whose love of the Orioles and Ravens is rivaled only by his love for travel. He’s been to over twenty countries including off the beaten path destinations such as Portugal, Croatia and Montenegro. Sean is a Destination Expert for Baltimore on Trip Advisor and currently lives in New Market, MD.